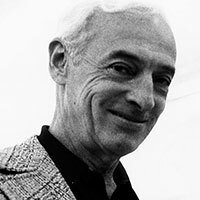 Saul Bellow (1915-2005) was a Nobel laureate in literature and one of the most influential American novelists of the 20th Century. A member of the University of Chicago faculty for more than 30 years, Bellow centered his fictional universe in Chicago, his hometown. Bellow, the Raymond W. and Martha Hilpert Gruner Distinguished Service Professor in the Committee on Social Thought and the Department of English at UChicago authored more than a dozen critically acclaimed novels and works of nonfiction, including Herzog, Humboldt’s Gift, Mr. Sammler’s Planet and The Adventures of Augie March. One of the most honored American writers of his era, Bellow won the 1976 Nobel Prize for literature, a Pulitzer Prize, three National Book Awards, and a Presidential medal. Bellow taught at UChicago from 1962 to 1993 in the Committee on Social Thought, and attended the College in the 1930s.